In the early 1990’s Joan Fetty stumbled on an HRC Magazine and realized this program would be a valuable experience for hunt test enthusiast in the Pacific Northwest. So Joan and her husband Bob contacted UKC to find out how to apply for starting a club. They were told nothing could be done. To keep in contact with HRC Joan and Bob joined the nation HRC so they could learn more by getting the magazine regularly. They continued to try other approached but to no avail. Finally, a new letter Joan and Bob sent to HRC caught the attention of Rod Smith who was HRC National’s Membership Chairman in 1998. He responded and our club was born. In January 1999, Joan and Bob invited ten people to come to a meeting to see if they would help start the club. People agreed we elected officers and voted on a name proposed by Joan: Whistling Wings. The people present were Joan and Bob Fetty (Bob became the first President), Dale Worthington (Dale became the first Treasurer), Kate and Bob Mearns (Bob became the first Secretary), Debbie and Boyd Ulsh (Debbie became the Vice President), Elizabeth and Daniel Cousineau, Peter Colley, Kate and Peter Szilard. HRC sent the required information to apply for membership and promised to send us some national officers to help us with our inaugural hunt as there were no clubs near us to help. The officers who came to judge and guide us were Pete Stritzinger HRC President, Glen Stelly HRC Vice-President, Claudine Cooper HRC Secretary, and Tim Gibson National Field Representative. Bob and Joan bargained with the Puget Sound Labrador Retriever Club to borrow their hunt test equipment in trade for the Fetty’s helping their club start a tracking program. So the club had equipment for the test. For the first test, land was rented from the Washington State Game Department. The second test was held at Greenleaf farms and Dr. Greenleaf donated the land to the club to run the second test. Judges to be grandfathered in were selected base on past experiences with NAHRA, AKC or CKC hunt tests. The judges were from Canada, Washington State and Oregon since the goal was to draw more interest to start more clubs on the West Coast. The new Whistling Wings Club set January each year as the annual meeting which was held in Joan’s Dog Training School Building, a pot luck, Elections and silent auctions helped the club to grow in membership, financial strength and HRC education. The second HRC Club in the region was Salt Chuck on Vancouver Island and for many years Whistling Wings and Salt Chuck were the only local clubs. Each year the lonely West Coast HRC groups went through growing pains, learning experiences, and always glad when an experienced HRC Judge would help at Hunt Tests. By year five, Whistling Wings had begun to be accepted by local Hunt Test participants and membership grew. Today the club boasts regular training days, two Hunt Tests a year, special events, dogs that have or are competing at the national level and a whole lot of great hunting dogs. New clubs continue to spring up on the west coast and the dream that Bob and Joan had when they started this in 1990 has come true!! 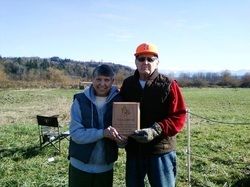 In 2011 Bob and Joan were awarded lifetime memberships in Whistling Wings. Andy Fontenot presented them with the award at the February 2011 annual meeting. Bob Fetty passed away on October 10, 2014 after a forty year battle with Diabetes. A Special Gathering to remember Bob Fetty and the joy he brought to our lives was held on Saturday, November 9th, 2014 at the NorthShore Senior Center in Bothell, Washington. For more information see our Memorial Page.